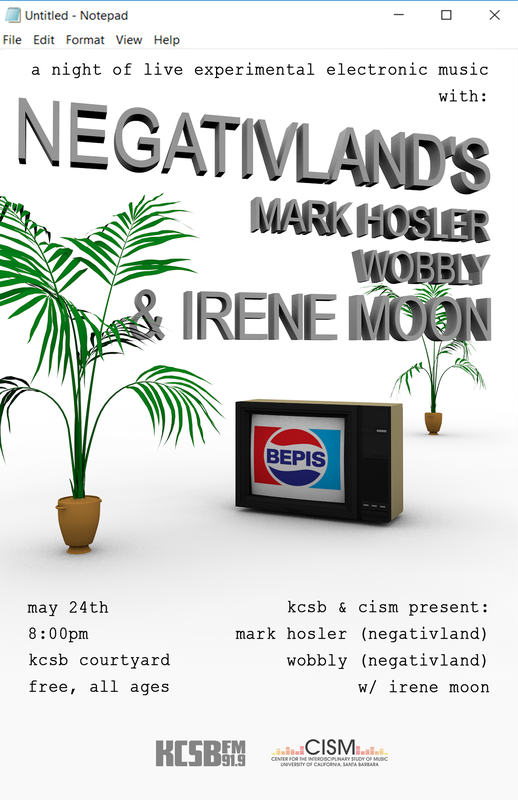 Negativland is an experimental plunderphonics project that specializes in audio sampling and that pioneered the "culture jamming" movement. Founded in 1977 and primarily active through the '80s and '90s, the group pushed the boundaries of copyright law and redefined artistic authorship. As they evolved, Negativland dabbled in sound collage, noise, spoken word, and more, all while honing their image of ironic corporatism. As a solo artist, founding member Mark Hosler manipulates and augments raw sound sources to create a choral rain forest of electronic ear candy, blurring the distinction between man and machine. Wobbly, who has been working with the band since 1987 and more officially joined in 2011, has since recorded with Thurston Moore, Moebius, and Matmos, among others. His music has expanded upon his work with Negativland, dipping into turntablism, glitch, indeterminacy, and more. The two are joined by Irene Moon, who fuses entomology with performance art for a musical PowerPoint presentation. Irene Moon also co-hosts "Unknown Territories" on KCSB-FM, which airs every Monday at 9am. On May 24th, each act visits the KCSB courtyard for a night of audiovisual experimentation. Doors open at 7:30pm and music begins at 8pm. This event is free, all ages, and open to the general public. Before the performances, Dave Novak (Center for the Interdisciplinary Study of Music) will be facilitating a round table discussion and plunderphonic workshop with the acts. The discussion begins at 2pm in the KCSB courtyard and is open to the general public. Each part of the night will be live streamed on KCSB at 91.9 FM or online at kcsb.org.